The dashing male counterpart to the charismatic Cleopatra, Antony is one half of one the greatest love stories ever told. Dying believe his own love was dead, but really she wasn’t and then she killed herself with an Asp... wait a minute, their demise sounds slightly ‘Romeo and Juliet’ but there love we know was real and the reasons for killing themselves were much more plausible than those of star cross lovers. In any case, Antony was not only a famous lover, he was a good military leader too. Antony (pronounced: AN-toe-nee) was the formely used English spelling of the name before the 17th century when the ‘H’ started to be added. Coming from Etruscan origin, the name means ‘priceless, flourishing, praiseworthy’. This spelling has never been as popular as the Anthony spelling but I find something quite modern about the Antony spelling, plus it fits in with other names like Atticus, Octavian and Augustus/August which are Ancient names making a comeback. 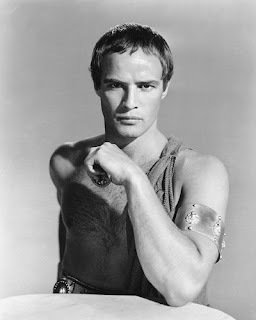 Mark Antony is not only known thanks to his own natural place in history but also thanks to the Shakespeare plays of ‘Julius Caesar’ and ‘Antony and Cleopatra’. Many famous actors have taken on the role of Mark Antony including Marlon Brando, Richard Burton and James Purefoy. Mark Antony is not the only person to bear Antony in their name either. In Christianity, St Antony of Padua was a significant cult; there was an Egyptian Saint known as Antony the Great plus there is also a village in Cornwall that is called Antony. In 2011, there were 146 boys given the name Antony. That is a small amount compared to Anthony which was given to 14, 181 boys in 2011. It ranked #956 in 2010 but dropped off the charts in 2011 and the name reached its peak in the 1970s. However, in France, the name currently ranks at #451 with 78 boys given the name though it reached its peak in 2000 over there at #194 and has been steadily declining ever since. This name is a different approach to the widely used Anthony but it should be seen as a possibility, as should the feminine version – Antonia. The name is rich with history and there is something just a bit dashing of a boy with the name Antony.